Laundry is a fact of life. But if you don’t have a properly equipped space, it can cause loads of problems. 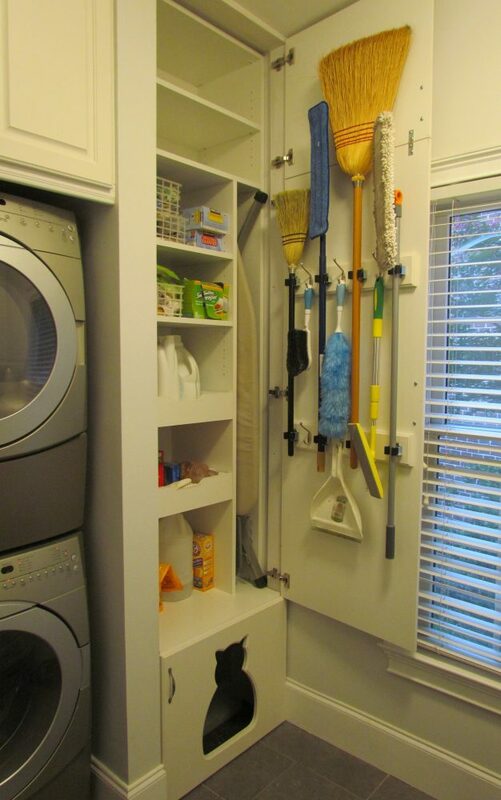 Tight narrow spaces and limited storage capacity are just a few of the difficulties that homeowners have to sort through in a small laundry room. 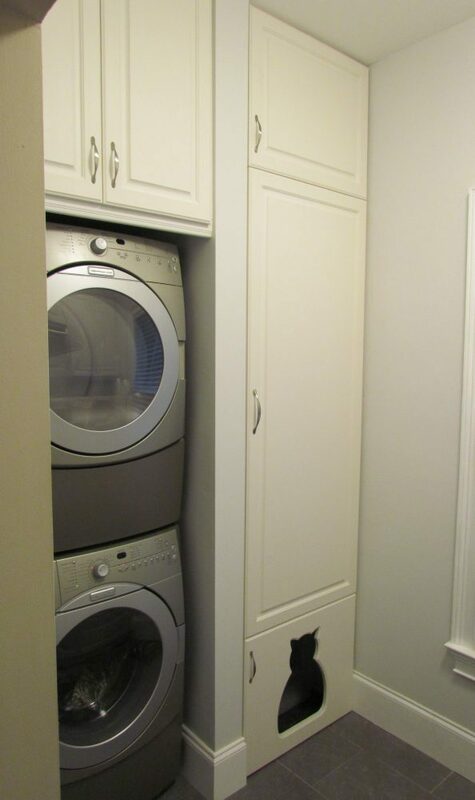 Several great solutions to those common obstacles can be found in a project we recently designed and installed for a young family to help expand their laundry room’s storage capacity and usefulness. More Laundry Room, Less Problems – To create the perfect laundry space, packed with function and a touch of style, we completely reworked what had been a typical small laundry room layout: a side by side washer and dryer took up one full wall with a few skimpy shelves above, while on the opposite wall two somewhat awkward closets made an attempt to accommodate brooms and a few more shelves. Stacked Up – To create more room, we went vertical! One closet was just large enough to fit the washer/dryer as a stacked set, a perfect use of the very deep, narrow space. Elegant Detail – Moving the appliances opened up an entire wall for cabinets, drawers, and an undeniably eye-catching marble countertop with undermount sink and glass backsplash. 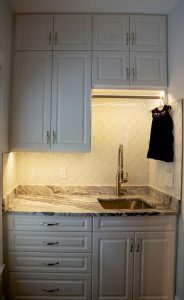 Underneath the sink is a recycling pullout, while above rest a hanging rod and upper cabinets outfitted with LED lighting. Completely functional and downright gorgeous! Ultimate Organization – Nothing says ‘fully equipped laundry room’ like tons of organized storage! In the alcove to the right of the stacked washer/dryer, we created pantry storage with a mini broom closet on the back of the door. The pantry cabinet features pullouts, adjustable shelves, and even a place for a full-size ironing board. 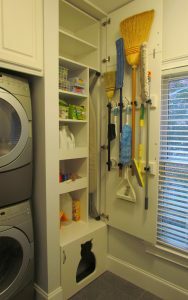 A compact and organized pantry, broom closet and ironing center all in one! 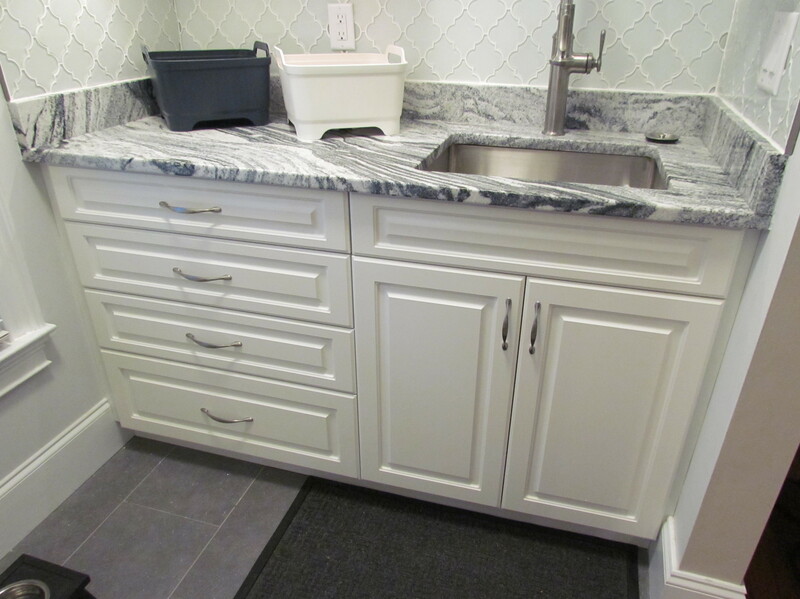 Fully Customized – Every detail of this small laundry room upgrade was designed with the family in mind, focusing on the most efficient use of the laundry space they already had and a comfortable elegance befitting their home and lifestyle. 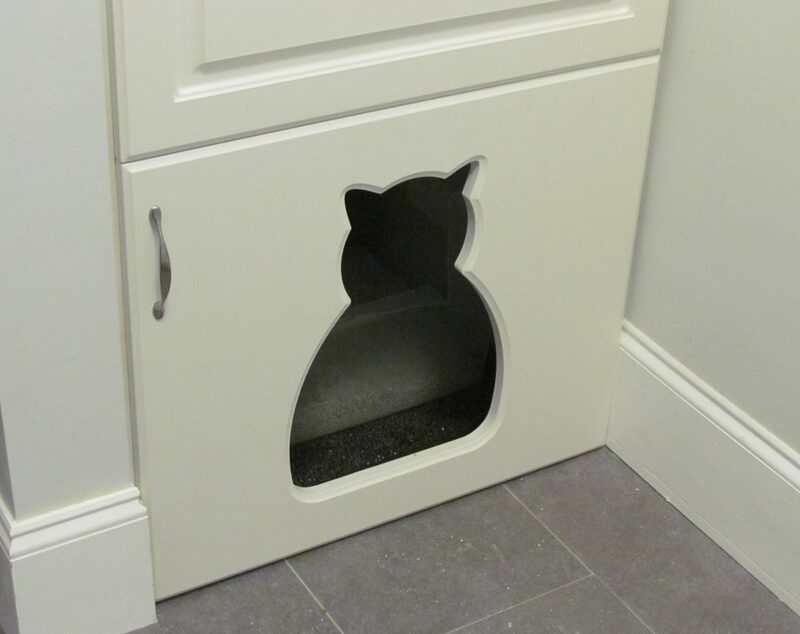 We were happy to accommodate a request for a litter box door with a kitty-shaped entryway, resulting in a completely customized project for the family – including the family cat. Project Impact – No matter how mundane the actual task of doing laundry can be, this family can now complete their chores easily and in style. 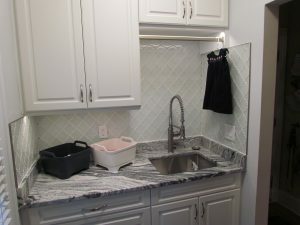 Their laundry room has fully come into its own as a bright and organized cleanup command center, with plenty of added function and style packed into their newly remade space. “We have a fantastic new laundry room!! David helped us remodel our laundry room. 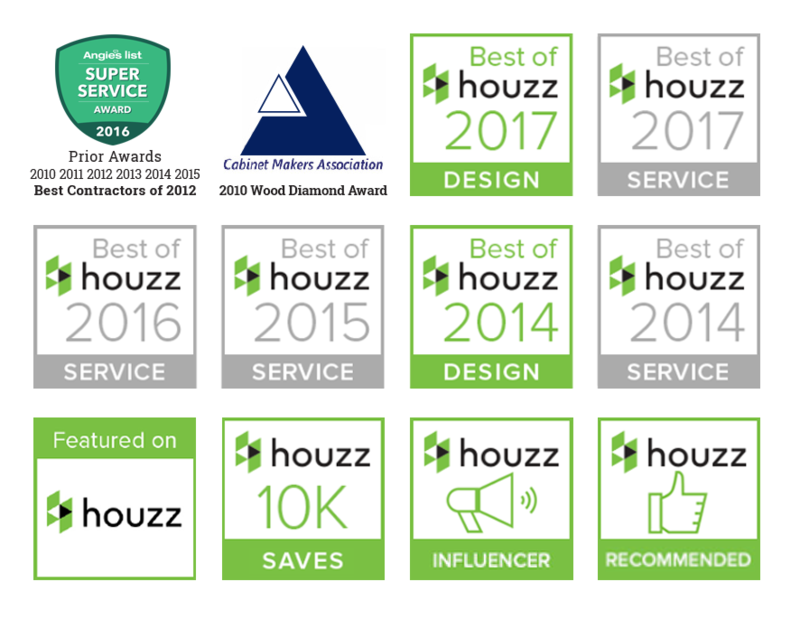 He worked with us from the beginning to help us reconfigure and maximize the space we had available. He went out of his way to meet with us on numerous occasions to go over drawings and electronic plans that showed what the space would look like under different scenarios so that we could visualize and decide what we wanted to do. He provided welcome input and advice to help us design the perfect space for our needs.